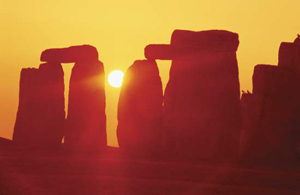 Midsummer, also known as Litha, Alban Heruin, (Caledonii), Alban Hefin (Anglo-Saxon), Gathering Day (Welsh),Vestalia (Roman), the Feast of Epona (Ancient Gaulish), All-Couple's Day (Greek), and St. John's Day, is celebrated the on the day of the summer solstice and is the longest day of the year. According to Gaelic lore, this day is especially sacred to Faery Folk as it was on Midsummers Eve that the first battle between the Fir Bolg and the Tuatha de Danaan took place. In many traditions a bonfire is built, around which the community dances and feasts celebrating the zenith of the Sun's power and majesty until dawn the next day. As the sun sets the God is burned in effigy to mark the end of the light and the beginning of the dark half of the year. Midsummer also marks the first of the year's harvest festivals: the herb harvest. During the short night many people use this time to harvest magickal herbs just after sunset to seal in the energy of the Sun at its strongest. Unlike Yule, during which we focus inward, at midsummer we focus outward and to the world around us. This a good time for protection, healing, and love magick. The Oak King, God of the waxing year is now at the zenith of his power. At the day's end He will begin his reign as, (or is slain and usurped by, depending on your tradition), the Holly King. As the mature Lord of forest and field He represents the harvest, contemplation, and growing wisdom. Enthroned beside him the Goddess, once the lithe and suductive Maiden of Beltane, now reigns as the pregnant Great Mother while the result of the Great Rite of Beltane, the Oak Prince, grows within her.